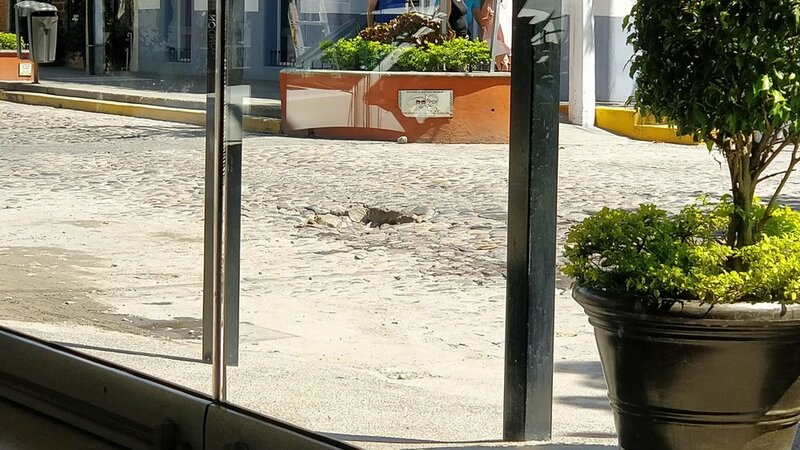 I was sitting in a cafe this morning eating breakfast, looking out the window, when I noticed a sizable hole in the middle of the intersection outside. Nothing out of the ordinary here in the cobblestone streets of Old Town, Puerto Vallarta. However, as I was watching this hole, I noticed that the majority of cars, instead of easily swerving around the obstacle, chose to instead dive right into it. Many cars bounced around wildly after striking the hole and some even seemed to incur damage. What was perplexing was that many of the drivers seemed to be aware of the hole’s existence as they approached, but instead of easily going around the depression, they made the conscious decision to chance it and drive right into it. In other words, the majority of drivers would rather risk a punctured tire or a misaligned or cracked axle than taking simple steps to avoid the hole altogether. Then it hit me: this hole in the street was the perfect metaphor for humankind’s current response to the gravest single threat it has ever faced, which is climate change. A new report from the UN Intergovernmental Panel on Climate Change (IPCC) concludes that by 2030 the Earth will reach a crucial threshold temperature of 2.7 degrees Fahrenheit above pre-industrial levels, a point at which global catastrophe will become reality. Seas will further rise, flooding coastal areas and major cities, forcing mass migrations of people. Extreme droughts, wildfires, floods, and powerful storm systems will wreak havoc on Earth’s surface. There will be disruptions of food supplies, resulting in possible widespread famines. And those are just some of the consequences. As the IPCC report makes clear, nations around the world must undertake "rapid, far-reaching and unprecedented changes in all aspects of society" to avoid the worst of climate changes’ effects. So what are people actually doing to avoid coming global catastrophe and mass extinction of species (including humans)? The depressing but realistic answer is nothing. People are doing nothing. There was a brief flash of light in the darkness, when in 2016 one hundred and ninety six nations came together to pass the Paris Agreement, a global framework that would sharply limit greenhouse gas emissions and keep the world from going above the dreaded 2.7 degrees Fahrenheit mark. But then a year later, in 2017, the United States withdrew from the Agreement at the direction of a President and administration who denies a catastrophic global crisis even exists. Already, we see the terrible effects of climate change. Every year the weather gets hotter; huge forest fires rage out of control, especially in the Western United States; increasingly powerful hurricanes slam into coastal cities, bringing death and destruction; and parts of Florida are now underwater because of the rising oceans. As I watched car after car drive into the hole in the intersection, the enormity of the challenge before us hit me like a Mac-Truck. We are not only dealing with the ineptitude of governments and corporations everywhere to rein this crisis in, we are dealing with the fundamental limits of self-preservation and human nature. The same forces that compel people to drive into a street hole, rather than around it, are the same forces that are compelling people to drive headlong into the deep and dark hole of climate change. That says volumes about the real human nature, and that is terrifying. There is one hope of salvation, however. One chance to take us back from the brink of the approaching abyss. Every one of us has the right to vote. One person, one vote. In November, vote out any politician that denies climate change is happening or whose policies are contributing to climate change. Vote, because all of our lives, and future generation’s lives, literally depend on it.